Whether you’re still learning how to sell on Amazon, or you’re already a pro, a really great way to monetize those skills is to offer them as a service to other business owners. This is exactly what I do at my agency, Kobel Consulting, and we do very well with it. There are so many business owners who need someone who understands Amazon and who’s willing to help them by offering it as a service to their business. The need for Amazon store managers just keeps growing as more and more businesses are getting on Amazon. With 50% of online shoppers now going directly to Amazon, business owners are really beginning to understand that if they’re not selling on Amazon, they’re missing out on a huge chunk of e-commerce sales. So, if you’ve ever thought about becoming an Amazon store manager, I highly recommend learning as much as you can and familiarizing yourself as much as possible with all things Amazon. If you’re skilled in Amazon and you know the ins and outs, it’s going to be a lot easier for you to approach businesses because you can draw on your personal experience and expertise. If you are still learning and you’re still a newbie, it’s okay. You can still approach business owners and offer this as a service as soon as you feel confident enough to do so. And I can help you get there. My favorite way to approach business owners when I was starting out was to make it a win-win for the client. I wanted to make it a total no-brainer for them to say yes by making them an offer that they couldn’t refuse. With my first client, I did the research and knew that he was not selling on Amazon, but also that his products would probably do really well on Amazon’s platform. So, I approached him and offered to list his products on Amazon, manage his store, and get sales through the Amazon channel, all for a certain percentage of his sales and no monthly fee. This posed very little risk to him as a business owner, so he agreed to my terms because I made him an offer he couldn’t refuse. His only real investment was the $40/month for his seller account, the cost of sending inventory and the commission we agreed on. And because he paid nothing unless he made sales, it was a no-brainer. This type of business agreement gives you a huge incentive to you to work as hard as you can to make sure that those products sell on Amazon, because the more that business sells, the more money you both make, and the happier everyone is. Go find a small business owner that you know, or visit a retail shop in your town or city. Do some research online and find someone who’s not selling on Amazon who you think would do well. It could be a brand of products that you like or a business you’d love to partner with. Approach them and emphasize what they are missing out on by not taking advantage of this huge market full of online shoppers. Then make them that offer that they can’t refuse. Depending on profit margins, your experience, and how much of a time investment you think it’s going to be, a typical commission will normally be somewhere between 3% and 15%. Once that’s decided, your job is to make sure their sales grow. You’ll make money. They’ll make money. They’ll be forever grateful to you and will hopefully tell all their friends. If you’d like to learn more about marketing your Amazon skills as a service to others, there’s no better place to start. You can also subscribe to my YouTube channel to see the videos I post each week. 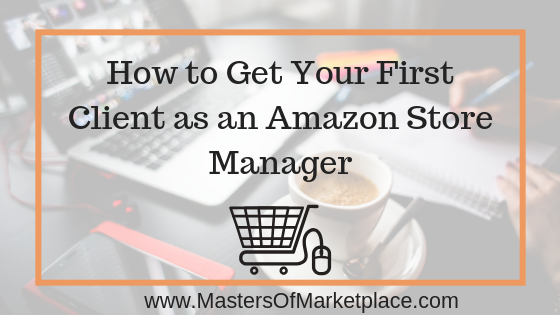 I’d love to see you in the Masters of Marketplace Member Site where we discuss all things Amazon all day long.